The 3Doodler and Lix 3D printer pens made some big promises during their crowdfunding campaigns: the ability to create 3D works of art, drawing straight up in the air. The Lix has yet to ship, but the 3Doodler never quite met those promises. It was loud, clunky and painful to use. The CreoPop is a new $89 3D printer pen that is scheduled to make its debut on Indiegogo today. During an in-person demo, the team behind the pen didn’t pretend that the pen will be faster, more ergonomic or more detailed than the other pens on the market. But they did prove that the pen is something different: a totally quiet device that works with ink that is cool to the touch, making it more friendly for use by children. During the demo, a CreoPop representative spent a few minutes printing a tiny flower and 3D box. The pen was able to print straight up in the air, but it was slow. The final version of the pen will include a button that allows users to increase or decrease the speed at which ink extrudes. The pen is based on a rival 3D printing technology known as stereolithography. 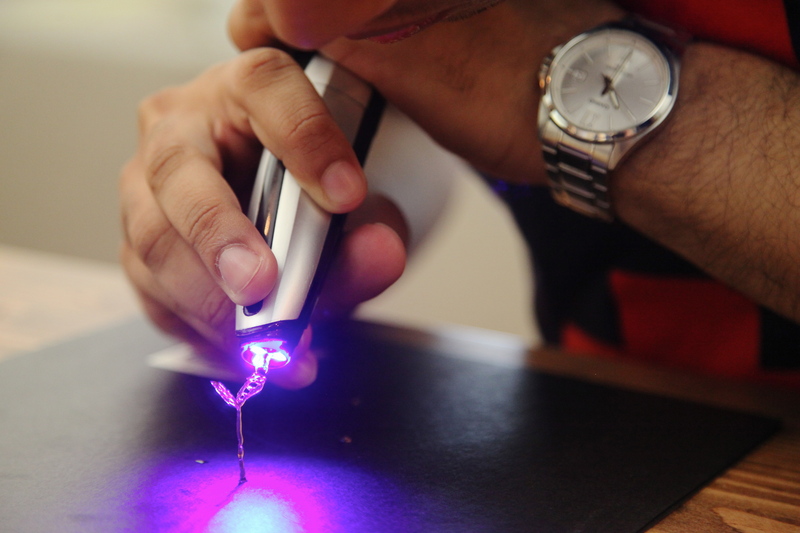 It puts out a light-sensitive goop, which is then hardened by a UV light attached to the pen’s front. Other 3D printing pens melt plastic that hardens as it cools, producing a lot of noise and, at times, fumes. The Singapore team behind the pen is working on inks that are magnetic, elastic, aromatic, glittery and useable as body paint. They have also made glow in the dark ink and ink that changes color based on temperature. Cartridges sell for $2-$3 and contain just under 46 feet of material. The CreoPop pen isn’t going to turn you into an artist more than the 3Doodler did. But it will provide some unusual options for inks that even desktop printers can’t provide.